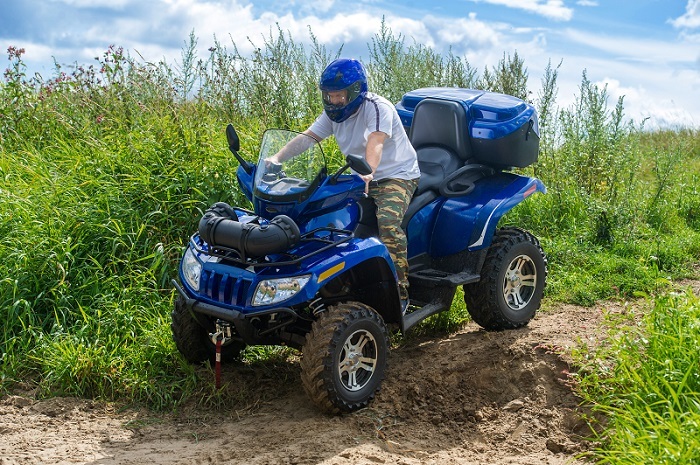 The day you pick up your new or used atv, one of the last things you may take the time for is to make sure she is ready to ride. All you really want to do is hop on and pin the throttle to see what it will do. Whether it is new or used there are a few things that you should do before taking off to make sure your new baby and you, make it back in one piece and can enjoy many years together. Check the engine oil, coolant and differential fluid. Make sure they are topped off. Wouldn't it be a shame if you experienced an engine failure your first time out, all because you did not check the fluids in your excitment. If the oil looks dirty on your used quad, go ahead and change it along with the filter. Check the lug nuts on your wheels. Even on new quads I have seen situations where there was a very loose lug nut or two. Not what you might expect, socertainly take a couple minutes to check them all. While you are checking the lug nuts, make sure there is appropriate tire pressure in all 4 tires. Inspect your chain. Especially on a used quad, make sure the chain has no weak links, is tightened and is well lubricated. Throwing your chain while flying down the trail can cause damage to your engine case or more. Check your air filter. This is how your atv breathes so you want to make sure that you are not choking it off while riding it. If it is a used atv, go ahead and throw a new one in. It is cheap insurance. This is by no means an exhaustive list, but more of a good starting point beforetaking off on that first ride. Take care of your new quad, and it will give you many years of great fun.